The southern section of Freedom Way SE. 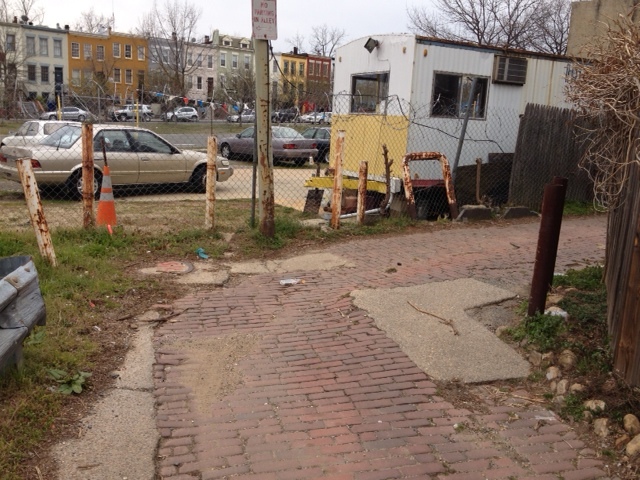 Neighbors have organized a Freedom Way Alley Cleanup for tomorrow, Sunday, April 14, 9:00 am. Come and help clean up the alley for spring. Brooms, rakes, shovels and bags will be available thanks to the DC Department of Public Works Helping Hands Program. A big thanks to Freedom Way resident Sarah Converse for organizing the cleanup. This entry was posted on Saturday, April 13th, 2013 at 10:59 am and is filed under Uncategorized. You can follow any responses to this entry through the RSS 2.0 feed. You can leave a response, or trackback from your own site. Sorry to post on another subject, but I thought neighbors who read this site should hear that Frank Zampatori passed away on Monday. He was a fierce advocate for Hill East and deeply involved citizen. As a new neighbor, I enjoyed chatting with him about the history of this place and hearing his opinions on all things local. He was a character. It’s especially sad that he was not able to see the new plans for the Res 13 parcel as he was an advocate of making something of that area that would benefit the neighborhood and the city. He will be missed.